Abigail Ogilvy Gallery is proud to present Fresh Faces, an exhibition that introduces new artwork by the Northeast’s most talented student artists, located in Massachusetts, Rhode Island, Connecticut, Maine, New Hampshire, Vermont, & New York. The exhibition features 28 artists working in a variety of styles and media. Allie Bartlett creates oil paintings based on personal sketches, photographs, and old home videos. She rearranges and decontextualizes these images of figures, domestic and night scenes, making them ambiguous. Her combination of content and technique is meant to elicit an atmosphere of detached nostalgia. She takes inspiration from the thematic and aesthetic principles of film noir, such as pessimistic nostalgia, chiaroscuro lighting, silhouettes, and doppelgängers. She is interested in the visual negation of information and intentional vagueness. Allie Bartlett graduated with a BFA in Studio Art from the School of the Museum of Fine Arts at Tufts University in 2018. Teddy Benfield compares and contrasts the social ideals of wealth and the display of goods found in Dutch still life paintings, Instagram food photography, and modern fashion advertisements. The dialogue created between these periods shows that despite the difference in time and medium, still life painting remains fundamentally about the display of goods and commerce. Benfield uses a combination of photography, print, painting, and paper making to epitomize the New England fishing industry while questioning the ideals of wealth commonly displayed in a still life painting. Through appropriation and re-contextualization, he shows the importance of advertisement and its direct relationship with commerce and socioeconomic value. He uses color, recognizable imagery, and traditional still life symbolism to make it known that 17th-century still life is for better or worse, an advertisement of one’s goods. Benfield questions the meaning of a still life painting by formally contrasting the shared concepts within the genre. Teddy Benfield received an MFA from the School of the Museum of Fine Arts at Tufts University in 2018 and will receive his Sneaker Design Certification from the Fashion Institute of Technology in 2019. Kaleigh Brann’s experimentation with ink drops stems from the Rorschach test, where viewers may interpret the piece based on their personal experiences and ideas. Polluted Peony comes from a series that explores the environmental impact of pollution by depicting ink as a polluted substance living and growing in the environment. Brann notes that in every environment there is an opportunity for change, either for better or for worse, depending on how the viewer interprets the photograph. Kaleigh Brann recently received her BFA from Montserrat College of Art. Damon Campagna uses drawing, painting, and printmaking to investigate methods in which the most elemental human marks—lines and loops—could be cataloged and recorded in an existential attempt to define one’s “self.” Campagna questions, “If one assumes basic mark-making is as unique to the human being as a heartbeat, running gait or sleep pattern, can it be similarly quantified, recorded and studied? Would it enable one to establish any sort of deeper, metaphysical “meaning” behind one’s art, and if so, what would it be?” He links his work intimately to the process of its documentation and comments on the consequences of both obsessively producing and collecting in pursuit of the unknown. Damon Campagna is a second-year MFA 2D candidate at Massachusetts College of Art and Design. Will Close bares the marks of a human hand in its interaction with the landscape. The marks modern humans leave behind on the Earth are violent and destructive. The scenes left behind show beauty and failure. Close has cut into and drawn on the canvas repeatedly with heavy pressure. Satellite images of Earth inform his perspective, structure, and visual organization. Unlike traditional landscapes, this piece has no vanishing point or clear ground plane, but instead, is depicted from above, disparate from the Earth on which we stand, reflective of our current relationship to the Earth, which is one of distance and disconnection. Will Close is a sophomore concentrating on fine art painting at Montserrat College of Art. Zoila Coc-Chang explores and questions her multi-cultural identities, homes, and anxieties through art as a form of escapism has been her primary focus in the last few years. Allowing herself to create landscapes of homes inspired by her experiences through flora, fauna, and natural sceneries—always keeping in mind her Chinese-Guatemalan heritage. She intentionally uses specific line work, color combinations and a thickly built-up impasto to render her world, experiences, thoughts, and questions to create an overwhelming, optical and tactile experience for viewers. Zoila Coc-Chang is currently a post-baccalaureate studying Studio Art at Brandeis University and will graduate in 2019. Vanessa De Zorzi juxtaposes the old and new, the organic and structured. Through oil painting, she explores balance; the push and pull of realistic details against flat, geometric compositions. The bold, graphic shapes of contemporary art inspire her work. However, her work also draws upon themes from art history. In her "Reflections" series, she explores concepts of impermanence and transience harkening back to Dutch still lives of the Golden Age. Through her studio art practice, De Zorzi approaches age-old questions with a modern lens. Vanessa De Zorzi graduated from Franklin Pierce University in 2015 with a double major in Graphic Communications and Fine Art, with a minor in Art History. In 2018, she received an MS in Graphic Design from Southern NH University. Samuel Drake’s recent work is inspired by investigating ideas of defense moreover the individualistic and community approach of protection regarding immigration and outsider threat. His hometown of East Anglia, UK, currently deals with the foreshadowing of Brexit, causing an overwhelming and unsavory rise in Nationalism. Drake’s paintings respond to this through the adolescent male who is entangled with objects which can simultaneously symbolize play and aggression. His paintings are situated within the landscape of claustrophobic community spaces and executed in high key, sickly sweet coastal palettes of chocolate-box painters such as the Bloomsbury group. His paintings focus on initiations, bipartisanship, masculinity, and lyricism. Samuel Drake is currently pursuing his MFA in painting at Rhode Island School of Design and will graduate in 2019. Demetri Espinosa draws heavily upon personal history, and especially his relationship with his parents. These drawings on manila file folders refer to Espinosa’s earliest childhood memories sitting on his father’s office floor scribbling on the backs of discarded documents. They are an examination of this relationship, described through the materials of that time and place. Espinosa is a child of immigrants—his mother is Greek and his father, Mexican. Consequently, Espinosa’s lived experience has been growing up between the two sharply divided worlds of his parents’ native cultures and an American one that has never fully felt his own. His paintings are an attempt to reconcile that conflict. Demetri Espinosa is a BFA student at Massachusetts College of Art and Design and will graduate in 2019. Vanessa Fischer’s mother passed away when she was fourteen years old. Thirteen years later, Fischer uses photography and video installation to depict her search for her mother’s essence through other mothers. The artist catches glimpses of her mom, be it within a specific gesture, stance, movement, or performance of a simple household task and for a moment comfort occurs while she becomes an adopted daughter. Her video, projected onto three decaying wooden screen doors, reveals her process of directing a mother to move through a porch door the way Fischer remembers her mother once did. Together, photographs and video installation express Fischer’s search and longing for her mother. Vanessa Fischer is working towards a Masters in Fine Art and Photography and Integrated Media from Lesley University College of Art and Design. Sarah Friedman’s Venus is Green superimposes a photograph of the aftermath from Hurricane Irma by Erika P. Rodriguez for the New York Times with a line from Anne Sexton’s poem “Venus and the Arc.” It attempts to shine a light on the obvious issues with the current movement in the scientific world to shift efforts towards the colonization of space and away from climate change reversal. Each piece from the series "flower photos from my phone" uses abstract gouache illustration paired with digital printmaking to explore vision, memory, and nostalgia. The pieces are made by painting forms, printing photos over the paintings, and then painting over those photos. The work is an exploration of how we map our lives through our memories. Sarah Friedman is a graphic designer pursuing her MFA at Boston University’s Design program. Emily Haag’s Micro Meditations is a series of daily paintings where the artist focuses her energy into mixing the paint, moving the sand, and feeling her emotions; simply acknowledging how she feels and letting that drive each piece without allowing negative emotions to overpower her and the works. Sand is a perplexing substance, being soft, inviting, and enveloping, while simultaneously abrasive and irritating. Haag uses sand to reflect and assist in coping with her social anxieties, moods, and emotions. The sand mixtures create thick sculptural marks that represent the weight of Haag’s anxiety but also echo the enjoyable memories and experiences of her childhood. Emily Haag is pursuing a BFA at Rhode Island School of Design and will graduate in 2019. Kaylee Hennessey showcases the body playfully and endearingly, in contrast to today’s social media stars. This piece is the first in an ongoing series of somatic works, each celebrating different aspects of the human body and persuading the viewer to consider their interpretations of beauty. Beer Gut uses different textures of yarn and familiar patterns to create a visceral and interactive interpretation of the human body. It allows the viewer to celebrate all aspects of the human belly, while also drawing attention to the fact that our interior will always shine through our exterior appearance. 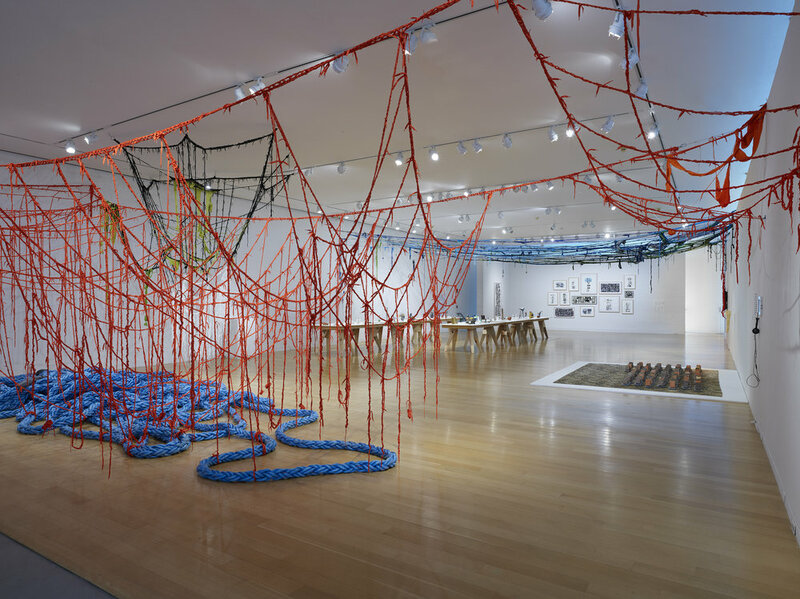 To create this piece, Hennessey allowed the materials themselves to decide the outcome of the piece, which is how she has worked exclusively since. Kaylee Hennessey is pursuing a BFA in Art History and Studio Art at Massachusetts College of Art and Design. She will graduate in 2019. Dimitri Kanellias explores the ideas of mental health, anxiety, and the ability to be present. His slab-built ceramic piece emphasizes a person’s inability to focus on what is happening and what is important. Its eccentric form creates movement as if its face is looking around for something missing. Sculpture has allowed Kanellias to question right and wrong and have a creative outlet to push the limits of materials and forms. Dimitri Kanellias will complete his BFA in Industrial Design at Massachusetts College of Art and Design in 2019. Abbi Kenny’s works are explorations in methods of depiction and figuration. In Mother, Kenny paints a photograph of her mother where the light from the window creates a beam of light and smoke imitating depictions of the Annunciation. Kenny chose this photograph as it is an honest image of her mother who was unaware that someone was taking her picture. In it, Kenny considers the relationship between her mother, painting, and the situational symbolism of the Annunciation. Nelson is painted from a compilation of several photos. In this smaller work, Kenny explores painting wet on wet and using a colored ground. Nelson explores the home, memory, the use of photographic sources for painting, and what spaces say as portraits of the people who inhabit them. These paintings are also considerations of domesticity and intimacy. Abbi Kenny is pursuing her BFA in Painting from the Rhode Island School of Design and will graduate in 2020. Katelyn Ledford’s work is concerned with our dependence on the virtual self in the digital age—a surface invention of who we are—and how such a creation can reduce our sense of “self.” Employing various methods of realism, Ledford explores the representations of selves translated and filtered through the internet and social media. The skin of her figures is often hyper-accentuated to juxtapose the idea of filtering with reality; she asks the viewer to study women closely instead of distantly through a screen. The identity of the figures and faces does not matter, just as virtual selves do not either. Ledford’s figures lack visible emotion, similar to women’s social media profiles that are expected to hide mental states and instead provide vapid entertainment. Her paintings discomfort the viewer as the figure’s gaze confronts them and raises the question of who is scrutinizing who. Katelyn Ledford is currently studying Painting at Rhode Island School of Design and will graduate with an MFA in 2019. Emmaline Lipka depicts memory and tests the boundaries of what a landscape painting can be. Lipka paints locations in Vermont where she grew up, along with places from family trips to California, Maine, and Florida. She extracts buildings, mountains, plants, and objects from her memories and reduces them to shapes and patterns that she combines with specific colors to create whimsical and engaging landscapes with a deeper meaning of personal memory. Emmaline Lipka is pursuing a BFA in Painting at Massachusetts College of Art and Design and will graduate in 2020. Lindsy Marshall is interested in cycles of life from transition to destruction. Each of her sculptures has a direct connection to nature and the entropy within it. Marshall delicately mixes each piece, layering different types of glass and binders, and placing them in a kiln to melt creating both a funerary process as well as the preparations for rebirth. Amalthea was created by glass powders packed inside different molds and heated with a kiln up to 1400 degrees. Marshall is interested in how materials transition through different states and how these processes compare to what humans and the earth go through. Lindsy Marshall received her BFA in Glass and 3DFA from Massachusetts College of Art and Design in 2017. Samantha Modder’s work is almost always figurative. She is interested in portraying characters that take up space and are unapologetically themselves, challenging, even daring, the viewer to see them as they wish to be seen, defying society’s standards. Modder seeks to create characters that feel life-like, with hair so rich you can almost feel the softness of their curls, and clothes that speak to their African heritage. She has made a conscious effort to use materials that are accessible, with her media of choice being ballpoint pens and sharpies. She does this to demonstrate that art can and should be for anyone to appreciate and to make. Modder wants her art to speak the truth and offer hope to those who see themselves in her characters. Samantha Modder, born in Nigeria and raised in Sri Lanka, graduated from Dartmouth College in 2017 with a double major in Engineering and Studio Art and later from the Thayer School of Engineering in 2018 with a B.E. in Mechanical Design. Sarah Montrond explores her identity through self-portraits as a white-passing, half-Irish and half-African American woman. Montrond often uses dramatically lighted compositions set in her studio, which has become more like a home during her time as a student. She makes clear color choices that play a significant factor in the overall mood of her work, often looking to the Western canon and pulling inspiration from the "greats." Sarah Montrond is pursuing a BFA in Painting, Art History, and a minor in Glass at Massachusetts College of Art and Design, she will graduate in 2019. Robert Najlis describes the shifting movement of colors and the overlapping folds of line, plane, and form through which this work evolves and emerges as a glissando. This movement creates a resonant space connecting viewers to the work, but also initiating their energetic awareness of their presence in space and time. Aesthetically, Glissando in Blue draws upon both Western and Chinese artistic theories. The painting began with the finding of dragon veins (龍脈), a Chinese technique which describes lines where yin and yang meet and interact. He combines this compositional sense with a theory of color movement influenced by sources such as Rudolf Arnheim, van Gogh, and Chinese silk brocade clothing to create a dynamic work that speaks of emergent phenomena. Philosophically, my work is related to Deleuze’s materialist metaphysics, where art is seen as the process of becoming rather than symbolic representation. Robert Najlis is pursuing an MFA in Painting at the University of Massachusetts at Dartmouth and will graduate in 2019. Kerrigan Nolan’s Lack of Motivation is a ceramic sculpture with childlike features and a desaturated color palette. The top of the disembodied head is removable, and the bright red interior harbors an I.O.U. note. This piece is meant to embody the feeling of being uninspired and unmotivated artistically. The emptiness in the head and the glazed-over eyes physically epitomize this state. This piece is part of an ongoing series exploring emotion through attractive and repulsive forms. Kerrigan Nolan is pursuing a BFA in sculpture at Montserrat College of Art. She will graduate in 2019. Andrew Palladino pulls from a range of subjects both natural and man-made to reform observations. Palladino integrates heavily stacked and layered drawings to meld pre-existing information while also driving the viewer away from real answers. This process became very important to Palladino in demonstrating his vision as an artist with OCD. He wants to deconstruct and rearrange elements as his mind does to his everyday observations. Some components of his work are meant to feel entirely together; then upon further investigation, the viewer realizes that these pieces are not entirely from the same puzzle, they are maps and diagrams to find yourself lost. Andrew Palladino graduated with a BFA in Printmaking from Massachusetts College of Art and Design in 2018. Josh Richards combines handmade craft processes, assemblage, and paint to explore texture, color, material, display, and functionality. Richards merges mass-produced everyday objects with made objects, juxtaposing the differences in quality, tactility, and versatility between them. Drawing upon people’s impulses to identify materials, he asks the viewer to slow down and merely look at what is in front of them. Josh Richards is pursuing an MFA in Painting from Boston University and will graduate in 2020. Ashley Schwebel’s Untitled is a raw concrete form in a finished, stained frame with embedded found rusted steel that hangs on the wall. In both her art and design work, Schwebel works with several mediums, exploring different processes, materials, and design elements. She is influenced by the urban environment in which she creates, and her approach is informed by a desire to find a unique character in a progressively mass-produced world. Ashley Schwebel is pursuing her MAT in Art Education at Massachusetts College of Art and Design. In 2010, she received a BFA in Industrial Design from the Rhode Island School of Design. Michelle Stevens’ pieces are inspired by the stories, dreams, symbols, and ideas from Carl Jung's writings in Archetypes and the Collective Unconscious. Michelle Stevens is pursuing a BFA in Illustration at Massachusetts College of Art and Design and will graduate in 2019. Sarah Valente explores representations of the natural world and scientific communities. The people depicted come from a variety of backgrounds and hold a range of identities and privilege. Dutch-African wax printed fabric and floral patterns reference globalism and postcolonial oppression, but also origin and destination. The tools of postcolonial critique allow us to understand the systems of oppression that control access to knowledge, and consequently power today. This epistemological framework can be applied to the traditional narrative approach of portraiture and the storytelling aspects of quilting. Sarah Valente is a post-baccalaureate student of Studio Art at Brandeis University and will graduate in 2019. Marika Whitaker’s piece is a relational map of power dynamics between text fragments. Whitaker creates text with map pins, then binds the texts together with one long thread that creates a three-dimensional form of the texts’ interactions, making visible the wobbles, inconsistencies, and patterns of power in relationships. When the balance of power tips too far in one direction or a surplus appears, the pins come out. Whitaker is interested in how power dynamics shape, wound, and heal intimate relationships. Marika Whitaker graduated from the Low Residency MFA Program at the School of the Art Institute of Chicago in 2018.